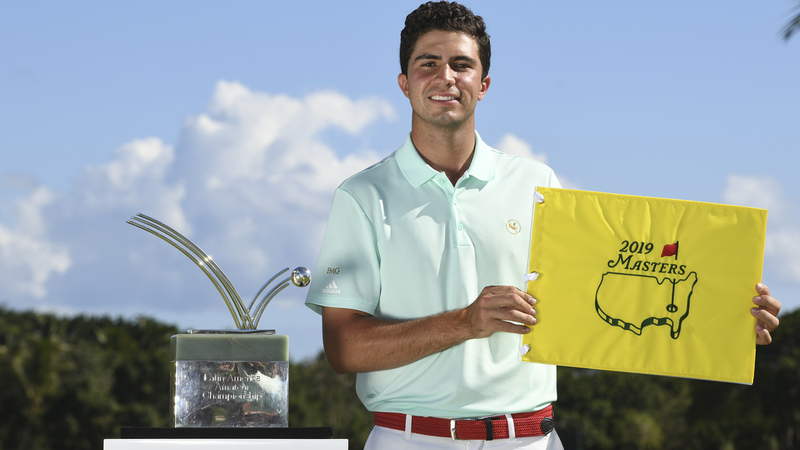 LA ROMANA, Dominican Republic – Alvaro Ortiz shot a final-round, 6-under-par 66 Sunday – playing the final seven holes at 5-under par – to win the 2019 Latin America Amateur Championship, played at Teeth of the Dog Golf Course at Casa de Campo. Overall, Ortiz shot rounds of 66, 72, 70 and 66 for a 14-under par total of 274 and two-stroke victory. With the win, Ortiz, a member of the Razorbacks’ golf team from 2015-18, receives an invitation to play in this year’s The Masters. He will be the first player to represent Mexico at The Masters since Victor Regalado in 1979. Ortiz additionally earned exemptions into U.S. Open sectional qualifying and Open Championship final qualifying. Ortiz opened the final round with a birdie on the par-4, 1st hole and he birdied the par-5, 5th. After a bogey on the 8th hole, Ortiz made a clutch putt for par on the 9th hole. He was one stroke back at the turn behind eventual runner-up Luis Gagne, who birdied five of his first 11 holes with no bogeys. Ortiz began his impressive run to the title with back-to-back impressive approach shots on holes 12 and 13. He would eagle the 12th, to tie Gagne at the time at -11. On the 13th hole from the rough, Ortiz knocked his approach to inside five feet for a birdie. After three pars, the last on the 16th hole which helped him take a one-stroke lead, Ortiz laid up on the short par-4, 17th hole. He nearly holed out from 99-yards out to set up a kick-in birdie and give him a two-stroke lead heading to the 18th hole. On 18, Ortiz split the fairway on the 548-yard, par-5 and reached the green in two. After lagging his eagle putt to a safe distance, Ortiz capped the Championship with a birdie to win the title with a 6-under-par 66 in the final round. Ortiz led by three strokes after day one with an opening-round, 6-under-par 66. He shot an even-par round of 72 on day two and stood one stroke back. Ortiz posted a 2-under-par 70 in round three and lead by one stroke heading into the final round Sunday. This was the fifth year of the Latin America Amateur and Ortiz has played in all five with two runner-up finishes and a third-place finish. He lost a playoff to Toto Gana in 2017 and lost the 54-hole lead to Joaquin Niemann in 2018. Arkansas freshman Julian Perico finished in a tie for 25th, shooting a 2-over-par 290 (77-65-74-74). This was Perico’s third LAAC, playing for his native Peru. He tied for fourth in 2017 and tied for 13th last season. Razorback junior Luis Garza, representing Mexico, played in his fifth LAAC but missed the cut for the weekend. Garza’s previous finishes were 37th, 38th, 44th and 11th, respectively.